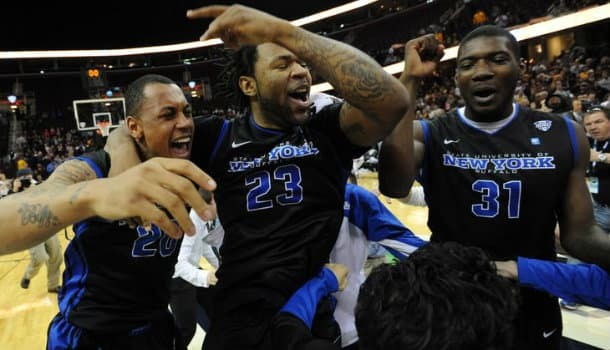 Just like Barack Obama – I have the #12 Buffalo Bulls 23-9 (12-6 MAC) advancing in my bracket over the #5 West Virginia Mountaineers 23-9 (11-7 Big 12) in the Midwest region. Buffalo beat CMU to win the MAC title and a big to the NCAA Basketball tournament. This will be the first time the Bulls have played in the big dance and I’m worried about nerves getting to them. Winning the MAC is one thing, but playing West Virginia in the big dance is another story. The Mountaineers lost in the QF against Baylor in the Big 12 tournament, but they were without their leading scorer Juwan Staten and Gary Browne. Both players are expected to play on Friday. Looking to wager on the West Virginia vs. Buffalo match-up on Friday? BetOnline has lines out for every market, plus they offer the biggest March Madness betting limits. Buffalo have been getting quite a bit of action and they’re a fairly popular underdog pick to advance past the second round. West Virginia are only –4.5 point favorites and priced at –195 on the ML. The Bulls are priced at +170 to win SU, but I recommend taking them at +4.5 points. The over/under is 149.5 points, but I’m not interested in betting the total. At 149.5 it could go either way in my opinion. These two teams can both score points in a hurry. West Virginia averages 73.9 PPG (36th) and Buffalo averages 75.0 PPG (28th). Neither team shoots the basketball well, but they’re strong on the glass. Buffalo shoots 43.5% from the field (178th) and WVU shoots 41.2% from the field (282nd). However, these two teams know how to get second chance opportunities. The Mountaineers are the best offensive rebounding team in the nation (16.8 ORPG), but Buffalo rebound well too. The Bulls average 12.9 ORPG (24th), although it’ll be interesting to see if they can come close to that number against a team like WVU. Buffalo haven’t been tested too often this season. A big factor in this game is how well Staten plays, as he’s banged up. Staten has averaged 14.5 PPG, 2.8 RPG, 4.6 APG and 1.1 SPG this season, but he isn’t 100% and that’ll hurt WVU. Browne averages 7.0 PPG in 19.9 MPG for WVU, but he doesn’t contribute elsewhere too often. The Bulls need Justin Moss to have a big game. He isn’t that big for a forward at 6’7’’, but the junior leads Buffalo in points (17.7 PPG) and rebounds (9.3 RPG). He’s almost averaging a double-double. I’m playing it as safe as I can and taking the Bulls at +4.5 on the point spread over WVU. Sure, the Mountaineers are the better team, but I’m not convinced they’ll dominate this game. First off, Buffalo can put up points and bang on the glass just as good as West Virginia. That takes away the edges the Mountaineers normally have against their opponents. Buffalo have been tested this year too – it’s not like they haven’t played anyone. They were smoked by Kentucky (71-52) in their 2nd game of the season, but played better against Wisconsin (68-56). At first glance, this is a match-up most bettors will look at and think WVU should dominate. That’s not the case in this one. Buffalo have nothing to lose, are playing great and will cover against the spread.